Lisa asked her faculty to write a bit to include in the blog and I've been so busy with deadlines and traveling that I haven't had the space/time to gather my thoughts. Didn't I plan to slow things down a bit in 2008? Didn't my friends threaten an intervention if I didn't cool my workaholic jets? Speaking of jets, I was just invited by one of my students (Hi Marlene Brannen!) to go on an adventure while I was teaching for the second time in Anchorage at The Alaska Bead Company. 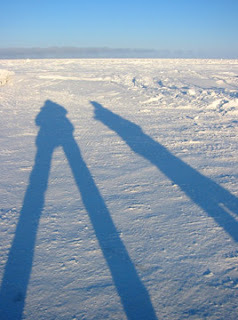 Flash forward: Its mid-day and minus twenty below (standing) outside at the top of the world. Literally. Marlene is working on her double loop-in-loop fusing project while I'm on a shared computer with satellite uplink... in a cozy hotel in Barrow, Alaska. Perched at the edge of the world, where hundreds of miles of frozen tundra meet the frozen Arctic Ocean, we are even further north than the Bering Straight. A vast "nothing" surrounds us. Why are we here? Why not! March is the best month to see the Aurora. If we are really lucky we may even see a polar bear (from the safety of a car since people are on the menu up here) and best of all, to learn more about the native people, their arts, crafts and lifestyles in such a beautiful yet harsh environment. Teaching (metalsmithing) opportunities? Maybe. So far the trip had been rich with insights. A few years ago I had a life coach/career advisory who inspired me (thank you Susan Zitron-Woods!). She had just turned 60 and the day before I met her, she had successfully walked on hot coals. With her guidance, I honed in on my loves: teaching adults, doing creative work in the arts and traveling. I've spent the past decade refining my multi-faceted career and becoming the master of my own ship. So here I am. I wish Susan was still around so I could thank her. Life is short. What's your dream job? Earlier today a handsome native artist (at the Inupiat Heritage Center) who was engraving baleen with images of his people reminded us that time slows down north of the Arctic Circle. I guess it has. I've finally gathered my thoughts to write something for Lisa. Beaducation NOTE - stay tuned for a full bio and many classes from Iris. We have shot Viking Knit and hope to have it up and ready for viewing soon! Iris - thanks for reminding us that we all need to live a passionate and inspired life. Hi Iris - I took your first classes in Anchorage and was sad that I was not there to attend your last classes - but a beautiful new Grandson called me to TN!!! Did you get to see the Aurora? Glad to got to see Barrow too! Thanks for all the information I have learned from you and wonderfuls skills!